I first met Ralph at our weekly Tuesday Drop-In Nights. He initially stood out to me for two reasons: Ralph arrived by motorcycle and he had a focus on the process of bike repair that rivals few others. 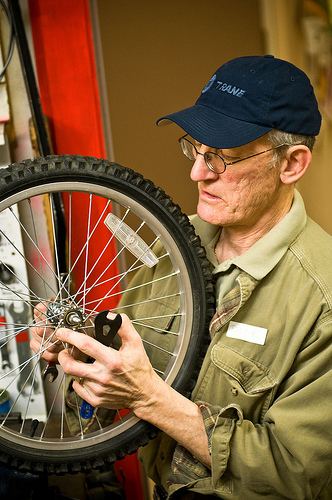 Over five years later, his volunteer shifts have transitioned from our bike shop to outreach and back to the shop, though his trademark moto-commute remains the same! These days, Ralph supports our Guest Mechanic Program as a Wheel Specialist. His consistency and aptitude for pointing out systems’ inefficiencies abounds, and we can’t thank him enough for his insights. For anyone familiar with our incredible Tuesday Drop-In Holiday Bike Drive Certification program, rumor has it that Ralph first suggested it. We’re not surprised. Ralph is thoughtful, dedicated, and a wonderfully articulate educator to volunteers and shop staff alike! We appreciate all that he has done with us. I like working on bicycles and the opportunity to expand my skills, I enjoy the vibe and people who work and volunteer at the Community Cycling Center, I believe in the mission, and I feel appreciated. When I retired from Intel Corporation in 2005, I was looking for a volunteer activity that was hands on, appreciative, evolving, and promoted values I believed in. I was enlisted by Neal Armstrong, then volunteer coordinator at a pre-Bridge Pedal bike fair in 2005. I immersed myself in Holiday Bike Drive rebuilds. At the Community Cycling Center, I have been in the Wheels Guest Mechanic Program since 2012 and Holiday Bike Drive before that. I’ve worked a number of Worst Day/Hottest Day of the Year Rides as a support mechanic and also numerous community wrenching events (see the Outreach Mechanic position for more info). Seeing Brian Benson, Gram Shipley, and Rich Walker recognize the need and then develop the Holiday Bike Drive mechanic certification, rebuild checklist, and “second check” process. I think it was a major step forward for the program that did a lot to reduce recurring quality issues. On the humorous side, repairing a bicycle taxi at a community wrenching event. 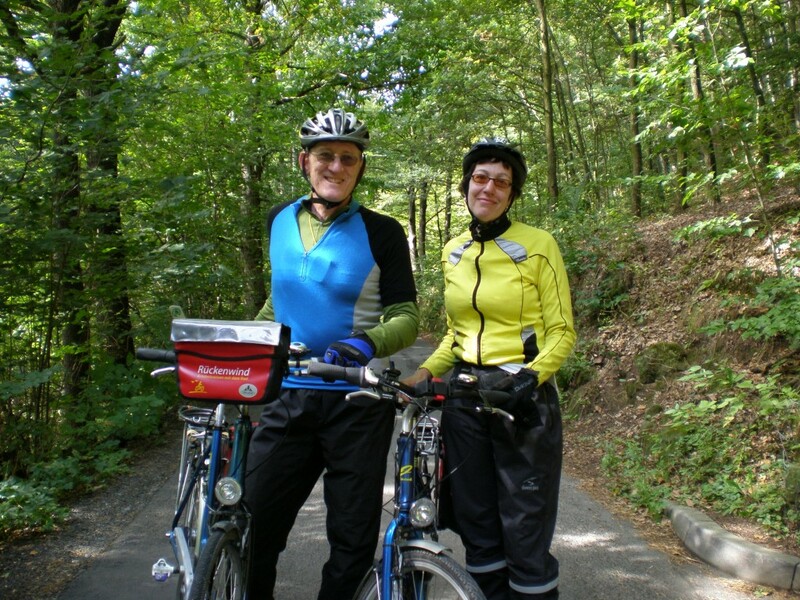 Do you have a favorite Community Cycling Center program? Why? I’m quite fond of wheels. It appeals to my engineer brain – working the 4 variables simultaneously toward a perfect balance. Of course one never quite achieves perfection. Community wrenching is my second favorite; I love the appreciative smiles from the recipients and the challenge of patching up aged equipment. Don’t get me wrong, I loved Holiday Bike Drive, but after 7 years, that was a lot of kids’ bikes overhauled. I still take a shift at the event, fitting kids to their new bikes. It means a lot of people helping in small ways to improve where they live, trying to create an inclusive environment, one that embraces progressive values. People would want to give something back to their community by volunteering their time, skills, and/or financial resources. I love vintage steel framed bikes from the 70’s (e.g. Schwinn “Paramount” or Cinelli) – Reynolds 531 DB tube, Nervex lugs, Campi Nuovo Record components, and a Brooks saddle, but then updated with SPD pedals, more cogs, and high strength rims. Lately, I’m thinking a pair of Brompton folding bike would be nice. I grew up on a chicken farm near Englishtown, New Jersey (pop. 1,500) and earned the money to buy my first 10-speed bike (an Atala) bagging and selling sacks of stale bread for a merchant at the local farmers market when I was 14. They might not see me wearing a dark suit and playing violin in a Community Orchestra, either, or sharing a coffee with my daughter before she moved to Detroit.